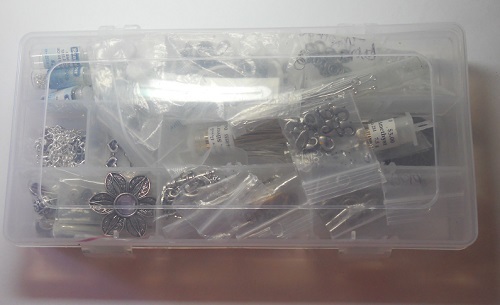 Getting started in any hobby is expensive, mainly due to having to get just the basic supplies. This is why Pinterest and DIY projects can be more expensive than just buying it already made. I have had people in Michaels say to me-Oh I saw this on Pinterest and they said they made it with just stuff around their house I want to make it too. Before you know it they are looking at $200+ in supplies. They say, “But she said she made it with stuff around the house.” My reply is but who is she-if she is a serious crafter than yes she probably did but if you have nothing to start with you have to buy everything they use and most people want instant gratification-sales and coupons only go so far in that case. 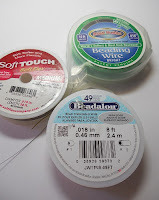 So here are basics you should have as a paper crafter or as a jewelry person. By no means is this everything one should or could have but just a start that will allow you to complete most projects. 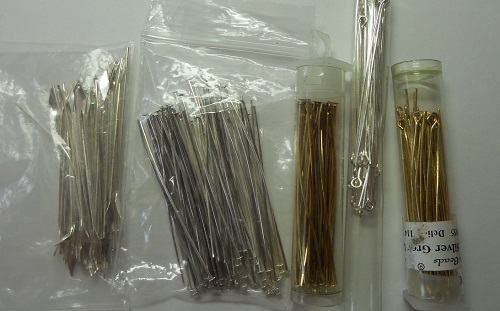 These are what are known as findings, which are what make jewelry wear able when you think about it. 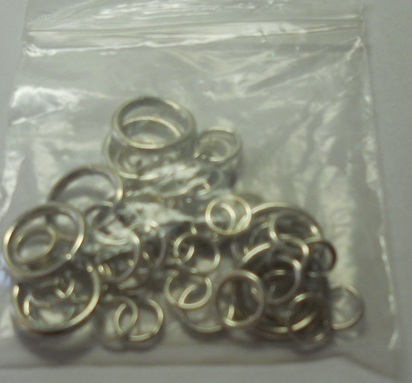 They come in several different finishes-starting off I recommend Silver and Gold colored findings because these are the most used. IF you are primarily making jewelry for yourself then you want to go with your personal preference then get the other color. Also if you prefer a different finish you want to have a supply of that color (for me it is gunmetal). 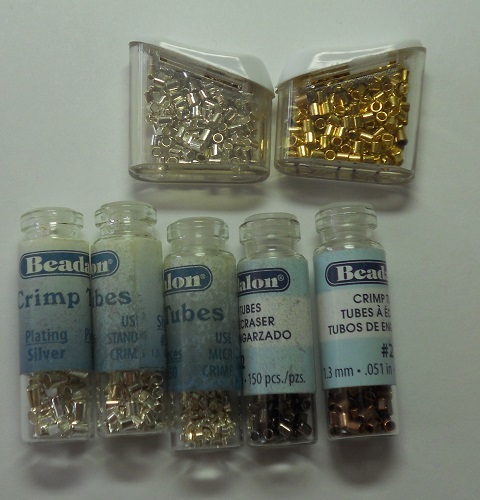 #2 or 2x2mm Crimp Tubes (not crimp beads but the tubes-beads never hold for long)-for these pick up either the Beadalon or company that makes the 1-Step Crimper (Not worth the money for the crimper by the way) multi-color pack for #2s-you get Gold, Silver, Gunmetal and Copper. Then I just by the packs of gold or silver as needed. 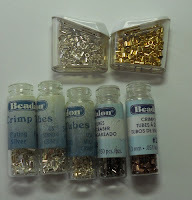 The plus is you have a container for the crimps and can refill it. 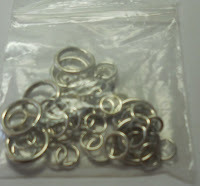 Split Rings- Multi pack to start with and then the size you most frequently use-for me 4mm and 6mm. If you look closely you will see some jump rings hanging out with them. Then you want something to contain it all. I use an Art Bin box that has movable dividers to bring my stuff to class. I keep it stocked from my main supply case but this way I am not bring every finding I have with me. I keep everything in 2x2 zip lock bags I get in the craft area at Wal-Mart for $1. 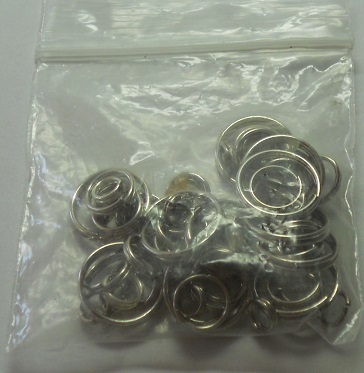 Don’t spend a lot of money on the Zip Locks because they tend to fall apart easily unless you buy the really heavy duty ones, also as you buy stuff online and in stores a lot of times they come in little zip locks and you can recycle. Bead Board or beading surface-I prefer the Bead Buddy Bead Board, this board has a nice neutral surface color, and a hard plastic outer case. This way you can stop close it up and move it without fear of dropping something. Also when opened it easily splits apart so now you have 2 surfaces rather than just one-great if you take classes with a friend. Good Lighting- This is essential. You need to be able to see clearly and not all of us have the benefit of natural light. Invest and get a good light that has True Color Bulbs anything else can make colors look off either too cool but usually too warm. 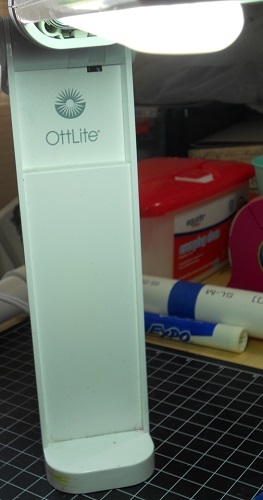 I use OTT lights, I still have my original one I bought in 1992. Yes, the bulbs are expensive but consider we are heading into 25 years, I have only replaced the bulb 3 times. And for the past 10 years, it has been the light for my computer desk on daily for long hours at times. How much do I love OTT, I have 10 of them. The only one I paid full price on was my first one and it was $30 bucks back in the day, the rest clearance or 60% off coupons. 3- I used as normal every day lighting, 1 for my art desk, 1 rechargeable for classes and/or workshops (and the occasional times I need extra light at my desk. 1 at my computer desk. Then 3 LED ones 2 small and one table top (this one use to be my class/workshop one but it eats batteries). The 2 small one are used like flashlights. And a book stand one, I used for when I take classes it props my book up and gives good light. For all of them I have spent under $125 total and only my original has needed the bulb replaced so far. 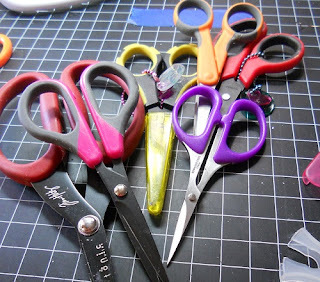 In all honesty, all you really need is a pair of scissors devoted to paper cutting, some shape templates, a ruler and a pencil/ball point pen. Everything else really just makes your life easier. Also figure out how much you are going to use specialty items before purchasing. The WRMK Envelope Punch Board is convenient and easy to use but if you make an envelope once in a blue moon then it is really not worth the cost when you can make easily without it. 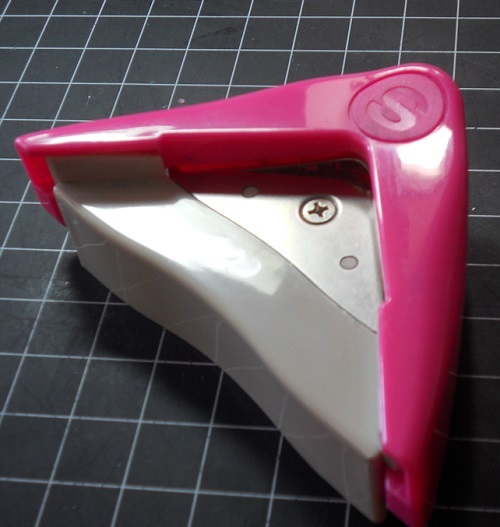 Paper Trimmer-I prefer the Fiskar Brand of cutters and their Titanium blades, which don’t wear out as fast. You want to get one that can handle a 12x12 size paper. 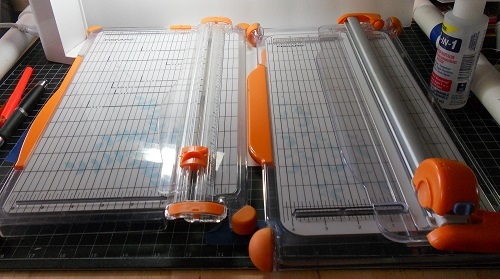 I prefer rotary blade one but also like the slide cutter one with the 6” wide base, perfect for card making can cut 8.5x11 sheet to the correct card base size without having to bring out the swing arm. 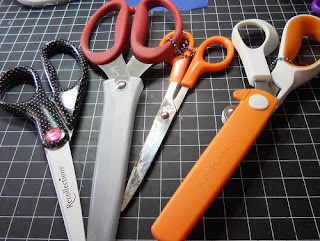 Large paper scissors-I actually get dollar store ones because paper kills scissors and this is not for fine detail but just cutting large shapes or cutting large blocks of paper away. Also don’t use scissors used for cutting fabric to cut paper. Detail Scissors-often called Fussy Cut Scissors-these can be expensive I am not going to kid you if you want wait for a coupon then pick up a pair of fingernail scissors at the dollar store. I prefer the EK Success ones with the yellow/black handle because they are coated so things don’t stick to them. 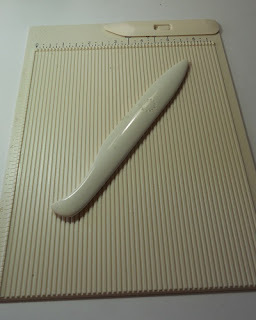 Ruler-Get the Tim Holtz one- it is thick, the markings are clear, but most of all it has a metal edge which means you can cut against it with an X-Acto Blade-never cut against a plastic edge. 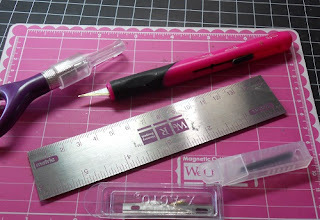 X-Acto Knife-Get the one with the retractable blade if you can just for safety or store with the blade in the plastic protector and downward, so accidents don’t happen. Always get extra blades, they can dull quickly and are more dangerous to you with a dull blade. Portable Cutting Mat-You want to cut on a cutting mat on bare table or craft work surface. My portable cutting mat is magnetic and came with a metal ruler. Mini Ink Blender by Ranger-these are the round ones. 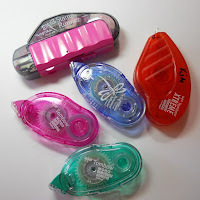 They are great for carrying in a scrapbooking tool bag and they do a great job of blending without leaving a harsh edge like the original can leave. Also buy enough pads to have one for every ink pad you blend with (this way they will last longer) plus a few extras for newer colors or so you can replace old ones easier. You can see the original blender in the top right and my craft mat right under the tin. 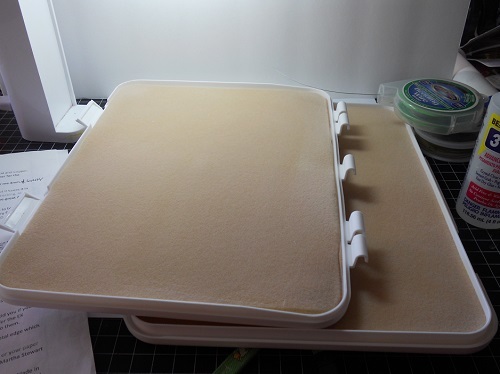 What is great about the mini blender is the pads fit in the empty spot under the mini ink pads. I put them in black side up, so I can just stick the blender right on it and pull it out. 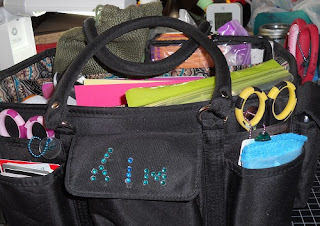 I normally don’t recommend storage but a Scrapbook Tool Tote Bag is a must-it keeps everything together and contained. If you keep everything in it at all times, then you can just grab and go if needed. Lastly-Sharpie Oil Based Paint Pen- Fine Tip in Black or White. If you ever go somewhere for a crop or class, you will discover everyone owns pretty much the same thing from the same companies. So write your name or initials ON EVERYTHING, including lids. 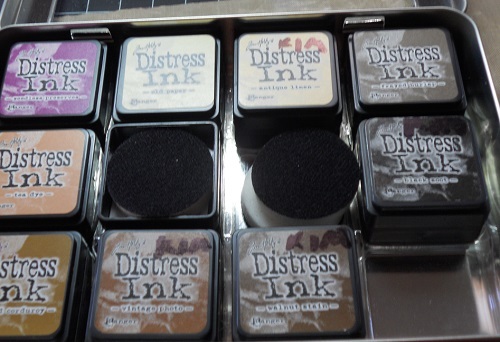 So when you are packing up and there 6 Tim Holtz Ink Blenders on the table you know which one is yours. I usually write on the metal and on the plastic one on each side. Some people use washi tape to mark it but what if you pick the same washi tape as someone else. Others use label makers, but Sharpies are Cheap and Quick. Also because it is in your handwriting it is another identification indicator. Tape Runner- You want Double Sided Adhesive Tape Runners, the brand is really up to you. I personally like Tom Bow and like the pack where you get a permeant, repositionable and a dot runner that can be refilled. I also like the Scotch ATG gun if I am working on a large project where I will be using a lot of tape-like a mini album. 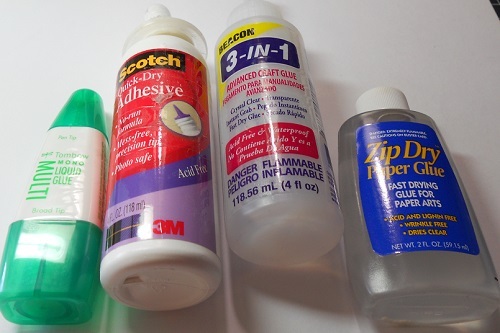 Wet Glue- I like Quick Dry by Scotch. Another two are Zip Dry and Tombow Multiglue.NOTE: Which Glue type to select is a later blog topic, and it does matter. 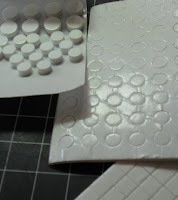 Dimensional Tape-I use both the squares and the roll depending on how much I need. You can buy circular ones but it wastes more because they cut it from a sheet of foam adhesive, sometimes you get this foam. 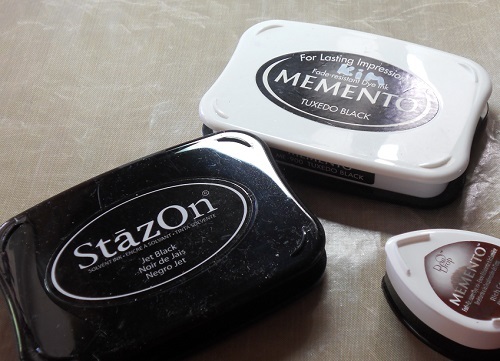 Memento in Tuxedo Black-quick drying and water resistant once dry. 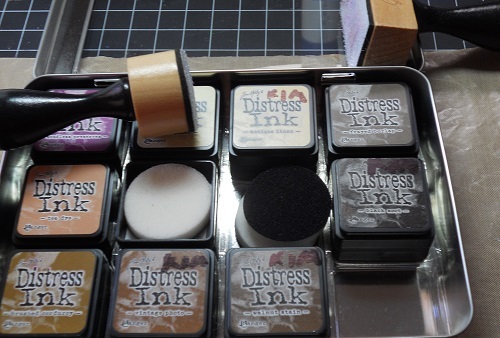 Tim Holtz in Walnut and Black Soot- To distress the card with either brown or black. If you prefer a lighter shade of brown-select that over walnut. Microns or Faber Castell pen in black-great for journaling and for doodling on canvas (once everything is dry). Score Board for scoring lines at predetermined spacing. Martha Stewart makes a 12x12 and a mini. If you are only making cards the mini is great. The 12x12 allows you to make larger items including boxes. 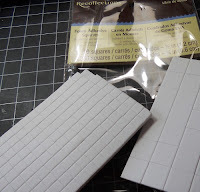 You can also make envelopes using these boards. WRMK Envelope Punch Board or the 1-2-3 Board- allows you to make envelopes easily for odd sized cards and envelope boxes where a normal envelope would smoosh the card a bit. Corner Rounder-to round corners on paper to give it a more finished look. Also put in your tool tote-some various sizes of zip lock style bags. 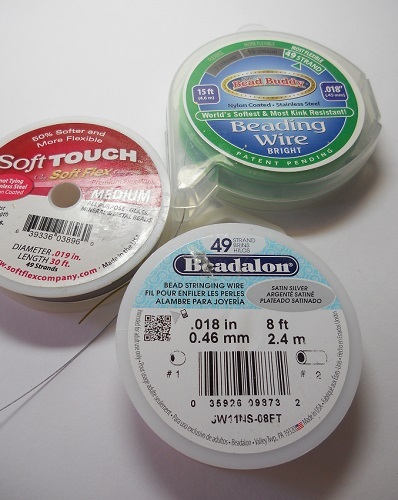 This is great to help contain small items that you might need for a project or class. Lastly, have a plastic bag or two. This way if you have a wet paintbrush, stencils, etc. you can transport them home without making a mess and getting things wet. And you can cut it open to lay projects on when transporting wet projects home.